Japan Podshow Episode 6 – Otaku Attack! In episode 6 of Japan Podshow, George and Joseph, prevented from leaving the house by the start of the rainy season, come to you live from the kitchen table. It’s a jam-packed episode, featuring two interviews: the first is with James Rees, an entrepreneur based in Tokyo who operates an import-export business, making use of Japan’s hidden ‘naishoku’ system (hosuewives doing piecemeal work at home to earn a few extra pennies, as seen in ‘The Last Samurai’), and a niche market that he discovered through his interest in …carp fishing. As well as giving an overview of how his business works, James talks about the problems he’s faced, and gives some advice to others wanting to set up their own companies. – a copy of which you can win in this week’s competition. Patrick, a regular contributor to Metropolis Magazine (which features Patrick’s book as it’s front-page story this week, and the podcast of which features Joseph once a week) knows more about Otaku sub-cultures in Japan than anyone else would dare to know – what started as a 600 page volume of his own notes on Otaku has now become a fantastic 200 page A-Z of everything Otaku you might find in Tokyo. 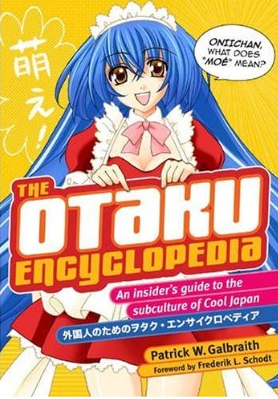 WIN A COPY OF THE OTAKU ENCYCLOPAEDIA! Congratulations to all of our winners of the Rinkya.com commission competition. The following people have each won $20 for use on the the fantastic Japan Auction & Online Shopping Service. For those of you who didn’t win, remember that it’s free to sign up with Rinkya – so go check them out! This week’s music is provided by Johnsons Motorcar. Blackie does the honors of introducing the band with a short interview: they’re a very lively Irish band who can often be found playing in Tokyo and beyond. Check them out on MySpace!